I hope you are great! Today, I have another blog post for you guys. While I was living in Berlin, I discovered some new brands that I was never heard before when I was living in Lithuania. I bought some makeup products, tried them and I just wanted to share my thoughts about them. So here we go☺! 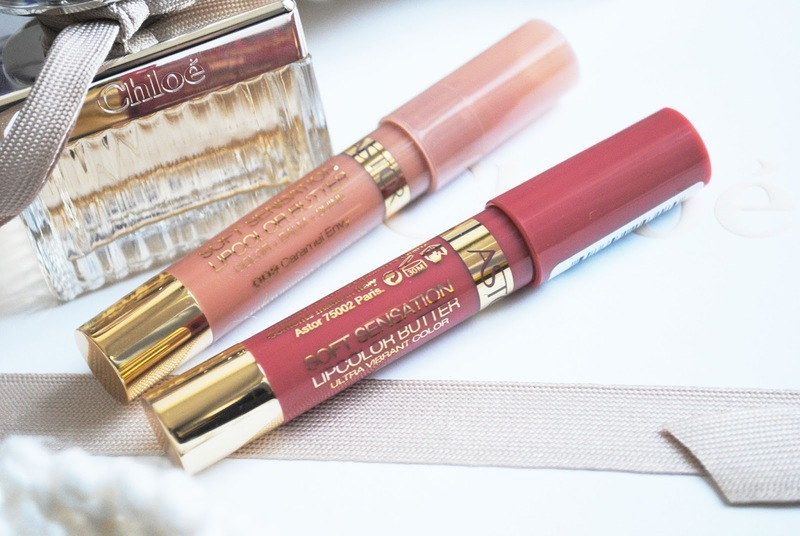 You probably know that I'm definitely a lip products junkie and I want to say that I'm very pleasantly surprised by these lip butters. I didn't try anything else from this brand, but I love this stuff! It says that it is a lipstick, lip gloss and lip balm all in one and it's true. It's very moisturizing, it gives you a vibrant color and it smells like vanilla! say what?! I have to say that I love the scent of vanilla, especially during cold season, because for me this scent represents warmth and everything cozy. This particular shade is very natural, you almost can't see it, but it has a little bit of glitter and it makes your lips look very good, they look very healthy. Also I want to say, that this particular brand teamed up with the famous model Heidi Klum. She is the face and artistic advisor of the brand. I was not very impressed by these eyeliners. I mean, it was very cheap, and for that price, yeah, I think the quality is good enough. It does the job, although the consistency of these eyeliners is very creamy so sometimes it's hard to put it perfectly. Anyway, I like this burgundy color a lot. It maybe doesn't show up on the picture, but it's burgundy, not black or brown. You probably all know the trick with white eyeliner. It can brighten your eyes. So with this I do the same trick. I just put a little bit on the inner corner of my eyes and then I blend it with my finger. It's an easy way to look more awake. Anyway, I have to say that I use everything that I buy, so I am really going to use up these babies too. Thanks for reading! Bye Bye. The lip products look gorgeous, even better if they smell like vanilla!